It sometimes seems as if we must erase our memories. The financial fiasco of my formative years was the S&L Crisis. The late, great, straight-shooting William J. Crawford told us during the hearings that ensued that "The best way to rob a bank is to own one." Here we are, some thirty years, and how many crises? later, well into the 21st century, still falling for the same con. Who would have guessed that film noir would be a trickle-down strategy? 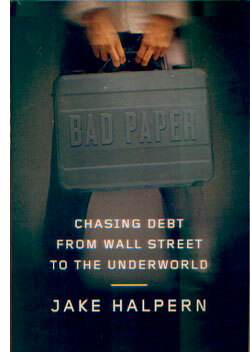 Look no further than the superb non-fiction noir by Jake Halpern, 'Bad Paper: Chasing Debt from Wall Street to the Underworld,' for a toe-tapping tour of America's latest financial underworld. In a little over 200 pages, Halpern succeeds where decades of legislation and one thriller after another have not. In this book, you meet utterly engaging real people who game the system from the bottom up. These characters, none of whom are exactly breaking the law, are wept into the grey zone of overdue consumer debt. There's big money to be made when you sweep up a lot of little fishes.
} At the center of the book are Aaron Siegel, a Buffalo-bred banker who was on a fast track to Wall Street, and Brandon Wilson, a former armed robber. Siegel, who had his hands in the wild world of hedge funds, decided to move back home, but quickly became bored working for Bank of America. In his spare time, he started buying consumer debt, which we learn is called "paper," even though it is really just Excel spreadsheets. He needed connections to get the paper, and muscle to make sure the debts got paid. That was Brandon. As Halpern tells their story, readers are immersed in a world next door, where what is legal is not exactly certain, even if it is certainly not right. Like every great noir storyteller, Halpern strips down to the essentials. We're in this for the scam, and men and women who combine bravado and desperation in a ratio that makes them incredibly entertaining. Halpern gives us that and a plot involving some "bad paper" that is twisty and unnerving. Brandon is a wild card, prone to effectively violent actions. Aaron is a money man, nervois to the hilt but unwilling to give up the thrills of this gray zone. Families and co-workers are vivid and all very engaging. We like them. But Halpern's careful to cover the other side of the equation as well, giving portraits of those who fell into unpayable consumer debt. These are bad apples. They aren't "takers." They're working single mothers, small families, working two and three jobs who fall behind. You can be sure of this; they don't own the banks, then owe them. 'Bad Paper' is written with a generous energy that makes it incredibly fun to read, even as it lays bare the tragic state of the American Banking industry. It turns out that those roaming piratical skyscrapers in Monty Python's The Meaning of Life were pretty much right-on. It's easy to forget that the American Wild West was financed from back East. Halpern's book is a timely reminder that works on a scale most of us can get. It's an incredibly important work because it is an amazing enjoyable reading experience. In this book, trickle-down non-fiction noir strikes gold. Dissonance is the name of the game, on every level. Humans are an arguing species, and what sets us apart is that our disagreements don't always end in death. But dissonance casts a wider net than mere argument. It can be as subtle as a whisper or as loud as a roar. And the best bickering reaches not a conclusion, but evokes an unease in the audience. 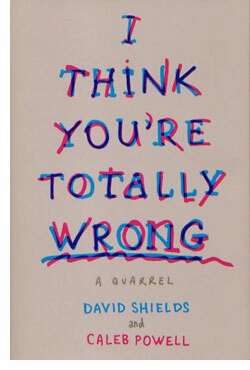 Prep for unease as you open up 'I Think You're Totally Wrong,' the book-length argument between David Shields and Caleb Powell. It's a work filled with contradictions from stem to stern. It's certainly unlike just about any other book in recent memory. but equally certain is that books such as this have a long and health history. You'll pick this up and think, rightly, "This is weird and daring," and then read it and feel like you're hanging out with two old friends — and you are, or will be. 'I Think You're Totally Wrong' is a transcript, lightly edited (so we're told) or a long weekend the Shields and Powell spent together yakking. The arguments and the book itself are largely unstructured. To this end, then, you might think that the book is only as interesting as the men, and they are certainly captivating speakers on varying ends of a variety of spectrums. Looking at what's in evidence here is pretty simple. The transcript format makes the book easy and fun to read. Chances are you'll whip through it faster than the average thriller. (Unless you leave it behind at the bookstore in disgust, or throw it across the room, both of which for some readers will be perfectly reasonable reactions.) But make no mistake, these are two engaging, witty guys, who don't have to try at all to be funny or insightful. It just happens on the page when they speak, and the book itself is a remarkable testament to the power of human speech. You may walk away thinking, "Forget the guns, break out the megaphones." But the real meat of the matter is what happens inside the reader, internalizing a book-length argument between two intelligent and generally respectful opponents. This is where disagreement leaves off and dissonance takes over. This is where you, the reader, become part of the conversation. By reading 'I Think You're Totally Wrong,' you internalize opposing points of view, perspectives that may yet be at odds with your own. You become the pressure chamber for all that disagreement, and in doing so, you de-pressurize your own fixations. You may not agree with either speaker, by but the end you may not agree with the version of yourself who started the book, either. It's a humbling, healthy and very human experience.